Last Sunday, TV viewers were treated to a news segment on home movies, broadcast by CBS Sunday Morning. Now available online, "Bringing the importance of home movies into focus," showed the origins of small-gauge consumer filmmaking and emphasized the need for preservation by featuring archivists from George Eastman House and The Center for Home Movies. Those organizations and many others have received funding from NFPF grants to preserve hundreds of home movies, many of which are now online. Here’s a brief but diverse sampler: From the Mayme A. Clayton Library & Museum come the home movies of Marie Dickerson Coker, an African American jazz musician, dancer, and pilot who filmed in Honolulu during the second world war. From The Clyfford Still Museum comes a home movie of Clyfford Still in his studio, the only known moving images of the Abstract Expressionist painter. 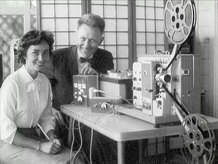 And from the University of Southern California’s Moving Image Archive come home movies of family life from Slavko Vorkapich, who created montage sequences for Hollywood, made experimental films on the side, and headed the USC School of Cinematic Arts from 1949 to 1951. If you have home movies of your own, or are interested in seeing more of these celluloid time capsules, make sure to visit one of the many Home Movie Days held around the country. Visit the Center for Home Movies website to learn more.